wyDay is based in the United States and has customers from all over the globe, including in the European Union. This means that today is a big day. Why? The General Data Protection Regulation (GDPR) is now in full effect. I won’t bury the lede: we’re fully compliant with the GDPR. For those who don’t know, or whose eyes glaze over at the sight of the word “regulation”, briefly, the GDPR can be best described as a new law that attempts to standardize scattershot regulations that various E.U. member states had thrown together over the years. Ultimately the goal of the GDPR is to protect user’s data (their names, information about them, including seemingly unimportant meta-data). And they way it does that is it gives “teeth” to the regulation in the form of big fines to any company that doesn’t adequately protect their customers data. This is great news for users (everyone in the world). This means that the next company that experiences a major data breach will paying big for their under-staffing and lax security. The only people grumbling about these new privacy regulations are companies that don’t want to invest time and money into securing their users data and companies that make money off of selling your data to 3rd parties. But make no mistake, the GDPR is great news for you as a person living in this modern world. Now we just need other countries to take similar steps. Going the extra mile to ensure our customers are using secure passwords. Most people that would end up on this blog are tech-savvy and already know what 2fa is. But, briefly, it can be described as a second code that you have to enter after you’ve already logged in with your username and password. This second code has, in the past, come from an SMS message to your cell phone. However, recent reporting (and even guidance from the NIST) has shown that sending a “security code,” or any form of 2fa, over unsecured mobile network is a bad idea. If SMS is bad, then what do you use for two-factor authentication? Enter the Time-based One-time Password algorithm (a.k.a. that Authenticator program on your phone that spits out 6-digit codes). We’ve very recently rolled out 2fa in LimeLM. And, in the coming weeks, we’ll add the extra security by letting you force your employees to use 2fa if they want to continue to login to your LimeLM account. Read all about it in our “Account security” LimeLM help article. These gauges are worse than useless: they don’t actually tell you if your password is secure and they might tell you that an actually-secure password is bad. The most favorable description I can give these “password meters” is they’re nice-looking pseudoscience. Unfortunately it’s not just toy web-apps that fall for that pseudoscience. 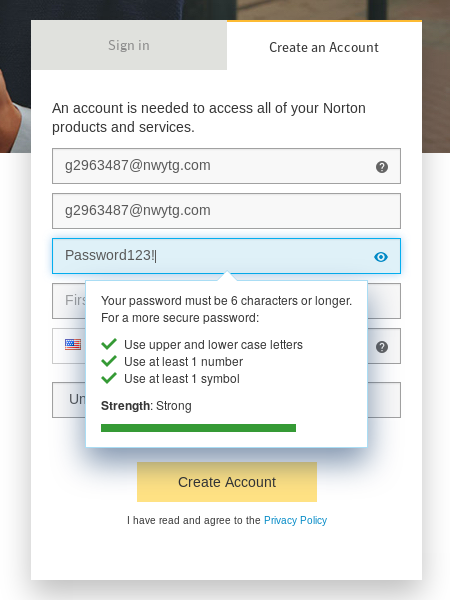 Security “aware” companies are prone to garbage-science (those images above are take from Symantec’s Norton product — and it’s still using those bad password indicators at the time of this post). 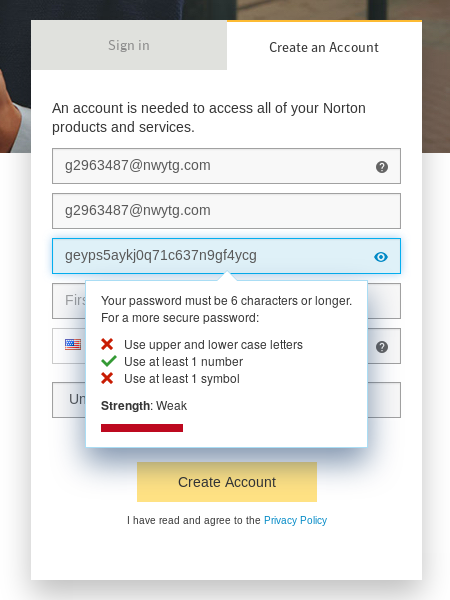 I’m not alone in the conviction that these password meters are useless (see: Password Strength Indicators Help People Make Ill-Informed Choices or Why you can’t trust password strength meters). Previously we didn’t care how long your password was. We just assumed customers would make good decisions and not use stupidly small password. Now, we enforce a minimum of 8 characters for passwords (as recommended by the NIST). So if “password meters” are garbage, how do we ensure you use a good password and, similarly, how do we actually verify that you are who you say you are? Forcing longer passwords solves part of the problem. As does enabling two-factor authentication. But we’re also going a step further and checking if your password has been compromised in another data leak from another company. We’re doing this by using the fantastic data from “have I been pwned?”. This allows us to verify the password you’re using hasn’t already been compromised (or is so weak that a billion other people use it as their password). All of these things together (plus the intrusion detection built into our back-end) ensure your data remains safe and secure.